» A Review by David L. Vineyard: K. K. BECK – The Revenge of Kali-Ra. 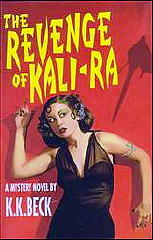 A Review by David L. Vineyard: K. K. BECK – The Revenge of Kali-Ra. K. K. BECK – The Revenge of Kali-Ra. Mysterious Press, hardcover, 1999. No paperback edition. A friend and I have a special category of book we refer to as Dollar Store Wonders. You are all familiar with the various Dollar, .99 Cent, and $1.09 stores around the country, and have probably noticed occasional racks or tables of remaindered books lurking in odd corners with big round stickers announcing their bargain prices. They vary from over prints of bestsellers to celebrity bios to westerns, sf, fantasy, horror, thrillers, juvenile series, and even a few actual mysteries. It’s in the latter category that you are most likely to find one of the rare Dollar Store Wonders that make the hunt worth your time, a first class book that for some reason you missed entirely when it came out, and has now made its way to the last hope of new books before the second hand book store, the library sale, or the card table at the nearest garage sale. One such Dollar Store Wonder is K.K. Beck’s The Revenge of Kali-Ra. In The Revenge of Kali-Ra Beck’s targets are broad ones — the overheated pulp work of Sax Rohmer and his ilk, and the overheated egos and money grubbing ways of Hollywood. Nadia thinks the time is ripe for Kali-Ra to stalk the screens of megaplexes all over the country and sets out to acquire the rights to Ricardo’s books. Which is the point at which the woodwork erupts. Nick Iverson is a great nephew of Ricardo’s who wants to know more about his family history. Lila Ricardo is the great man’s whacked out widow and Quentin Smith an unscrupulous lawyer for Maurice Fender who owns the rights to the Ricardo books and wants to cash in. In addition there’s Glen Pendergast, an academic who penned a study of the Ricardo oeuvre The Whip Hand: Issues of Gender in Genre in the Novels of Valerian Ricardo. Then there’s Gail and her daughter Callie, a more-or-less normal post-teenager with a penchant for running around near naked and impersonating Kali-Ra, her namesake. Of course they all end up at Nadia Wentworth’s exotic Hollywood mansion, and then one of the uninvited guests shows up dead and Internet fans of the masters works start stalking the night, and we’re ready for a wacky twist on Agatha Christie where nothing and no one is quite what we expect them to be. Among the many delights of the book are several overheated passages of Ricardo’s prose that are among the best evocations of the fractured prose stylings of the past you will encounter in many a day. It’s no easy thing for a good writer to write badly well, and Beck pulls it off with real panache. You may even find yourself wishing she had actually written a full novel of the adventures of Kali-Ra to accompany the book, or at least a short story. The brief passages are tantalizing. The Revenge of Kali-Ra is a truly funny book. The people are bright and brittle. and the humor barbed but never cruel. It’s a fast read full of attractive protagonists and eccentric everyone else and begs for a film treatment. Kali-Ra will rise again. You can’t keep a really good bad girl down. Beck had written fourteen books at the time of Revenge, including Murder in a Mummy Case, Young Miss Cavendish and the Kaiser’s Men, The Body in the Volvo, and four entries in her Jane Da Silva series. They are all bright and funny mysteries that combine real wit with appealing mysteries and a quirky but assured style that is among the most readable in the genre. K.K. 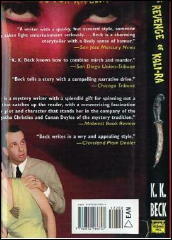 Beck made her way into the mystery scene carving a niche of her own in the humor category. But where much of the humor genre is decidedly in the cozy tradition, Beck has always had a streak of Marx Brothers style insanity in her best work, a wry twist of the knife that lifts her novels to another level. Although Beck comes from another tradition, the true screwball voice of Jonathan Latimer, Craig Rice, Dwight Babcock, Norbert Davis, and Richard Sale sings from her word processor. The Revenge Of Kali Ra is a romp, a playful send up of writers of popular fiction, Hollywood, and the grand old literature of the purple prose school. But I warn you, you may never read Fu Manchu or Sumuru with a straight face again — assuming you could keep a straight face the first time you read them. And for a Dollar Store Wonder it is a prize above rubies, or at least one heck of a bargain. I am really touched. You seemed to have had as much fun reading this dollar store wonder as I did writing it. Thanks for your kind words! Cheers, K.
Absolutely agree with your review. I bought The Revenge of Kali Ra through Daedelus Books and loved it – smart, funny, great characters and plot. I’ve since bought a half dozen more of Ms. Beck’s works and have enjoyed each one. I’m currently reading the third (or fourth?) Jane da Silva novel – Electric City and its as good as they come.